— the good city, m.A.A.d city album is a concept album in which Kendrick tells the story of how Kendrick grew up and eventually made it against all odds in the dangerous city of Compton in California. here, our protagonist, Kendrick talks about smoking (weed) and drinking when usually he doesn’t do either, except when he’s with his “friends”. this is significant because a lot of people and especially teenagers nowadays can relate to this since most of them started engaging in vices such as drinking and smoking due to the fact that “everyone else was doing it”. — here, Kendrick talks about beating up someone along with his friends and laughing about it just because his friends are doing it. — just like most of us, our parents and older ones advise us against such practices but we forget all that “talk” when we’re among our friends and in social settings. — gang violence (mostly from the blood gang and the crips gang) is almost synonymous with los angeles, but Kendrick says although he never belonged to any gang, he had family members and friends who were. so although he was usually non violent, he could be seen “riding” with such people. — Kendrick and his (gangster) friends attacked some members of the rival gangs and they drink and brag about the “episode” but he doesn’t feel remorse cos he’s just chilling with his friends. 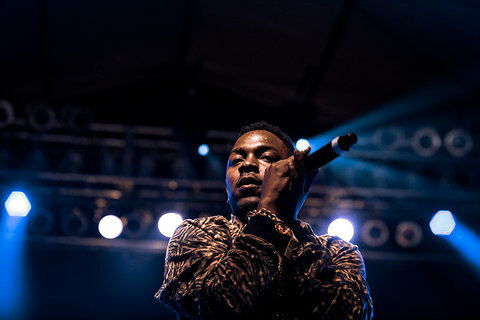 — in the song, Kendrick went to along with his friends to a house they had been doing surveillance on for about 2 months and robbed it, unfortunately they had to leave hurriedly when the police came..
— here, Kendrick makes a metaphorical expression and how following friends and doing what’s “cool” leads one nowhere, “circling” life, how unprogressive it is. he’s also talking about the turns they take while trying to beat the cops. — while they were running from the police cars, his mother called and he lied to her that he was just “kicking it”, when he was so close to being arrested as a result of his activities with his friends. — Kendrick describes the turns the police cars take and eventually missing him and his friends, describing it as “one lucky night”. — the rest of the song or story ends in a conversation among Kendrick’s friends while Kendrick has passed out. apparently, his friends gave him weed that was laced with some cocaine, they decided to drop him at his mother’s home and go back in the city and look for more trouble cos they wanted to be “the man in the streets” just like a young jeezy song said. peer pressure is a serious issue among young people anywhere in the world. young men and women from even the best moral upbringing and background cannot resist the allure. no one wants to be a cast out, the reject, the odd one out and do all sorts of mindless, stupid things all in the name of fitting in. However, it is always good to think before ones actions and evaluate why you should do what your friends want you to do, if they say you MUST do it, you probably don’t belong among them. it always good to have a mind of your own, know what works for one cos people are different. Like Kendrick, he was fortunate, many other people are not. a lot of people have had promising futures ruined due to peer pressure, some have even lost their lives. but then again, what can we do without friends?